The majority of non-divers all say that they have never been interested in scuba diving because they just don't have the time it takes to get certified. Today, scuba diving courses are offered at more resort hotels than ever before. In many cases your scuba training will begin right in your hotel pool and take less than four days. You can become a fully certified diver in about three days, for around $300-$700 US Dollars, depending on where you go. Diving certification is available to all those age ten and up, so learning to dive can be a family activity. Most dive centers offer a introduction to scuba which will allow you, with minimal instruction, to try out breathing underwater to make sure you like before you start the certification course. Generally speaking, scuba diving is no more expensive a hobby than golf. That said, like golf, scuba diving has plenty of room for the big spenders who collect hobbies so that they can collect the gadgets that go with them. It is possible to rent a mask, fins, wet suit and everything else you need from your dive center. However, you should eventually buy your own mask, especially if you wear glasses you will want to get one with prescription lenses. The first priority is to decide where to go to get certified. Hawaii, Fiji, and Australia are all great places to start diving. The Great Barrier Reef off the eastern coast of Australia is one of the best dive destinations in the world. 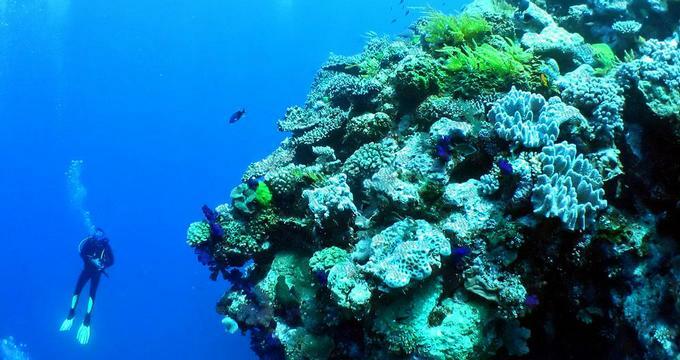 The Great Barrier Reef offers great diving as well as luxury accommodations. Heron Island is a small resort that is actually on the Great Barrier reef with over twenty different dive sites nearby. Maui is perfect dive destination for first time divers. Nearly all of the best hotels on Maui offer diving certification or have an affiliation with a good dive shop. Lahaina Divers, one of Maui's best dive operators, offers a complete three day open water certification course for $299. Hawaii is a very popular spot for vacationers whether they are diving or not so sometimes it can get crowded on the water. Some famous dive spots like Molokini Crater are full of dive boats throughout the day. This is not a problem because there is plenty of room for everyone underwater and most beginners find it comforting to be around so many people on their first several dives. Oahu is also a great destination for divers of all skill levels. Fiji is a more private dive area since most of the vacation resorts are on small islands so dive groups are usually small from 5-10 people. One added bonus is that since most rooms in Fiji are on or over the water getting from your room to the dive site is not much more than a ten minute boat ride. Vatulele Island is a private island in Fiji which is a certified PADI gold palm 5 star resort as well as one of the most luxurious resorts in Fiji. Fiji is a excellent starting point for first time divers who may want to combine learning to dive with their honeymoon. Next time you are planning a vacation, remember to find out if scuba diving classes are available at your destination.